When Dr. Nick Nelson, the medical director of the Highland Hospital Human Rights Clinic, walks the halls of his Oakland medical center, he’s getting a peek at atrocities around the globe. His patients include Eritreans who have been forced to live in metal containers, Mexican immigrants who have been electrocuted by the cartel and a Mayan woman who had watched her sister get raped in front of her in Guatemala. His patients come from all over the world. And these asylum seekers are looking urgently for his specific medical skills. His diagnoses are crucial. Nelson assesses his patients’ physical and emotional states, and then provides immigration attorneys with documented, forensic evidence to prove they were tortured, abused and persecuted in their homelands. And he says the number of people fleeing from torture is more common than the average person thinks. “I would say whether or not you know, basically if you’ve been outside in Oakland, you’ve probably encountered someone who’s been tortured in their home country,” Nelson said. In six years, Nelson’s medical team at Highland Hospital’s Human Rights Clinic – the only one of its kind in Northern California — has helped at least 200 immigrants receive asylum in the United States. There are only about 20 such clinics nationwide. 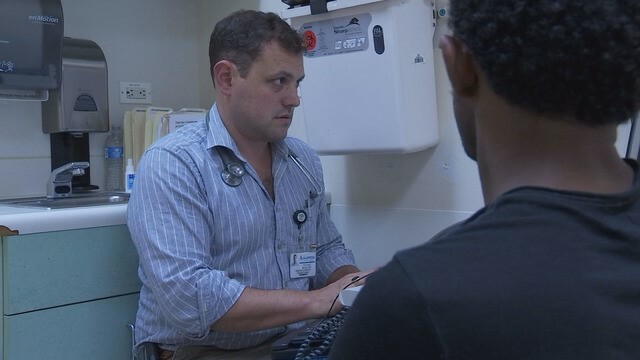 And with the help of physicians like Nelson, alongside the work of immigration attorneys, refugees are granted asylum 87 percent of the time, compared to the average of 37 percent, according to data compiled by Physicians for Human Rights. The job is difficult. But Nelson knows his special skill set can mean life or death for the influx of refugees fleeing to the Bay Area. And he knows that the timing of his help is even more important today, as it comes at a crossroads with the current Trump Administration’s attitude on immigrants, asylum seekers and refugees. Last week, Secretary of State Mike Pompeo said the United States will slash the number of refugees it will accept for a second straight year. The latest statistics make Nelson’s work more daunting, but helping his patients find safe refuge is his life’s passion. Over the last month, Nelson gave KTVU a rare peek at his the Highland Hospital Human Rights Clinic. KTVU’s team interviewed three patients fleeing from Guatemala, Mexico and Eritrea and agreed to protect their identities by blurring their images and not using their real names because they fear harm would come to them and their families back home. The three patients interviewed all arrived in the Bay Area within the last two years, which they noted is a most unwelcoming time politically for people in their situations. All of their asylum cases are pending. “I see it as a death sentence,” said Ammanual, who fled from Eritrea, and is now terrified of being sent home. Patients like Ammanuel come to Nelson because they have medical ailments: Low B12 counts, numb legs, depression, poor mobility of limbs. But they also come to Nelson, specifically, so that he can document their tales of horror and then testify in immigration court on their behalf. Nelson scours his patients’ bodies, looking for signs of physical trauma: Burns, scars, broken bones and gunshot wounds. He also listens for signs of emotional distress. Can his patients not sleep because of the violence they saw and endured back home? Are their memories impaired? And he uses his cultural knowledge of torture around the world to detect whether his patients’ stories match up with abuses documented by the United Nations and Amnesty International. In only rare cases, he said, does he find that his patients are not telling the truth. Nelson then writes up a report, similar to an FBI affidavit, which he then submits to immigration attorneys. His testimony is added to the official court record. Jennifer Rampton is a Fremont immigration attorney who has referred about 15 clients to the Highland Hospital Human Rights Clinic. On a recent weekday morning, Abela, a 20-year-old Mayan mother who fled Guatemala, came to Nelson’s office, hoping that he and his team could help her and her 4-year-old son stay in Oakland. That’s where mother and son fled to in 2016, and where she is now living with a friend and cleaning houses. Her eyes downcast, Abela described years of violence, persecution and discrimination by the ruling cultural group in Guatemala. Her son, who was once malnourished, sat in the small doctor’s office beside her, smiling and drinking milk from a blue bottle. As she spoke, sometimes in a whisper, she often had to control her tears. This was her first visit to Highland Hospital, and one of Nelson’s residents did the initial intake, documenting what Abela said and then preparing the paperwork for immigration court. Just before her appointment, Nelson had seen Carlos, a 30-something father of two from Michoacan, Mexico, who said he literally ran from Mexico this spring, getting shot in the process. This was also Carlos’ first visit. Carlos said he watched his nephew get killed before his eyes. Wearing a gray baseball cap, and crossing his arms in front of his chest, Carlos said that the Mexican cartel kidnapped him and his nephew for 24 hours and tried to force them to work for them before he was able to escape. Nelson, who speaks fluent Spanish, listened to Carlos to figure out a medical treatment plan. And then he also went back to his office to write a medical report: He noted the many scars on Carlos’ body that are consistent with being whipped by a chicotewhip. And he wrote how Carlos’ left thumb is damaged because of a gunshot wound he sustained at the hands of the cartel. Nelson also discussed Carlos’ nightmares, his resistance to watching anything violent on television and his inability recall simple things like his wedding anniversary or his childrens’ birthdays. Nelson attributed the physical and emotional duress to violence Carlos suffered by the cartel kidnapping. Carlos, who worked in the fields in Mexico, is now living in Hayward with his wife and two children. Nelson’s current patients hope to have a future like Mohammed, 53, of Alameda who was granted asylum five years ago. “This man is a very great man,” Mohammed said of Nelson. Mohammed, a computer tutor, fled physical abuse and imprisonment in Yemen in 2013 and was granted refugee status that same year, in part, thanks to Nelson and his immigration attorney. In addition to treating Mohammed’s medical issues and memory impairment, Nelson also helped him find work, a job and a home. Mohammed said he is now applying for citizenship. The Highland Hospital Human Rights Clinic opened in 2001 as a place for asylum-seekers and refugees to get care. Nelson, who took over as director in 2012, says his team does about 85 evaluations a year. And still, the waiting list is three months long. Nelson usually sees his patients for an hour, taking long oral histories. The exams are grueling. Many patients get emotional during these visits, remembering the torture they sustained. Often, patients don’t want to remember. In 2009, Soldiers grabbed Ammanuel at a cafe with his friends, kidnapping him and forcing him to live in a metal container for months, he said. They bound his wrists together with a metal rod, hung him upside down and beat him with fists and electrical wires. They accused him of having high-powered connections to allow him to skirt military enlistment as he should have in the 10th grade. He denies any such relationships and insists he skipped out on the military simply because he wanted to finish his education. To this day, one of his legs is numb and won’t move properly. While the patient load and demographics hasn’t changed that much under the The Trump Administration, Nelson said the mood definitely has. He also said that with recent court rulings, more refugees are being held in ICE detention facilities, and aren’t allowed to see their doctors in their offices. That means, in the last two years, Nelson and his team have made more than two dozen “house calls” to ICE detention centers. Before 2016, Nelson said he had rarely made such a visit. “I get up at 4 a.m. drive four hours to Bakersfield, and then hope to be home by 9 p.m.,” he said. And many of the cases that Nelson oversees, including patients who allege gang violence, will have a “much higher burden of proof.” Nelson was referring to Attorney General Jeff Sessions’ proclamation in June that gang violence and domestic abuse are not grounds for asylum. For now, Abela said that she believes in God and she has faith that she’ll one day be able to live in Oakland legally and not be forced to return to Guatemala. Going back for her is simply not an option. And even though she struggles here in the Bay Area, Abela said her life is markedly better than back home. She said that now her son is happy and more active. She is thankful they both can get treated at Nelson’s office and live a life free from persecution. “I’m just looking for a better life,” she said.